Draining tracts or fistulas can be seen extraorally in association with facial swelling, or intraorally. Facial swellings and draining tracts may be related to tooth root infections, abscesses or completely unrelated to teeth. Facial trauma, cysts or tumors (cancers) may be the cause of extraoral draining tracts. A combination of causes may be associated with draining tracts as well. We frequently see patients that have previously had teeth removed, and draining tracts subsequently developed from extraction complications. These complications include: fractured tooth root remnants, alveolar bone fragments, or other sequestra. If the discharge is discolored tan, yellow or green, an infection is likely. Intraoral draining tracts can be related to infection, trauma or foreign bodies. The location of intraoral draining tracts is very important. Draining tracts located apical to the mucogingival line are commonly related to tooth root infection and abscesses. Draining tracts from the attached gingiva, or from the gingival sulcus are often related to periodontal infections. Antibiotic therapy is rarely sucessful on a long-term basis in treating draining tracts. There may be an initial benefit from antibiotics, however, when they are stopped, the draining trackt quickly returns. Diagnosis of the source of the problem is extremely important. Dental radiographs with periodontal probing is fundamental and essential in diagnosing the cause, and treating draining tracts or fistulas. 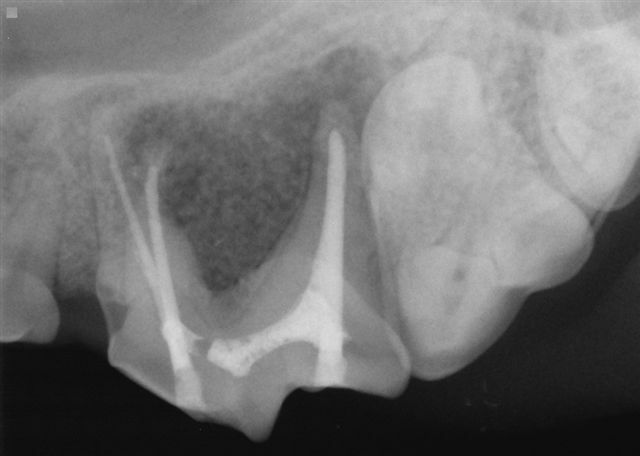 If the problem is related to retained tooth root fragments, they must be surgically removed. If a tooth was previously removed, radiographs are needed to be sure the correct tooth was removed, and whether the entire tooth has been removed. If there is an infected tooth, the tooth can be treated and saved, or it must be surgically removed. If there is a foreign object (sticks are common) lodged below the gumline, it must be surgically removed. Some medical conditions may result in draining tracts. Medical conditions must be diagnosed and appropriately addressed. We have identified oral cysts and tumors as the source of draining tracts. The exciting news is that not all tumors offer a bad prognosis, and Dr. Kressin has an intense passion for surgical oncology. Dr. Kressin works with a medical oncologist, as well as with other specialists to help diagnose, and optimally treat medical and oncology cases. We provide an in depth dental consultation to provide useful information for pet owners to help make decisions about diagnosis and treatment. We find this "team effort" approach to decision making very helpful. Suborbital tract with "purulent" discharge. 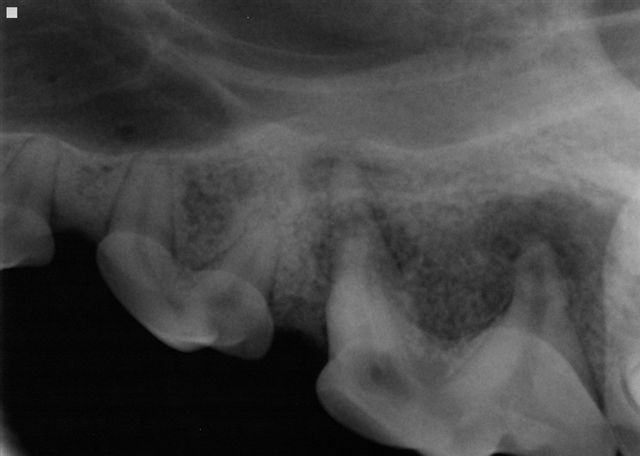 Dental radiograph of this young dog demonstrates severe tooth root pathology. Root canal therapy effectively resolved the draining tract, and saved the tooth. periodontal probe placed into the fistula. Tooth extraction resolved the fistula. This submandibular draining track was from a foreign body penetration. Facial swelling with draining tract from the nose. Draining tract with "purulent" (bacteria and white blood cells) discharge. line with a "purulent" or infectious discharge. for two years to resolve this infection. There was severe bone loss due to chronic infection. Draining tract under the lower jaw from severely infected canine tooth. Antibiotics and steroids failed to resolve this after 18 months. Root canal therapy effectively resolved this problem! good idea to wait. Extract fractured primary teeth immediately.